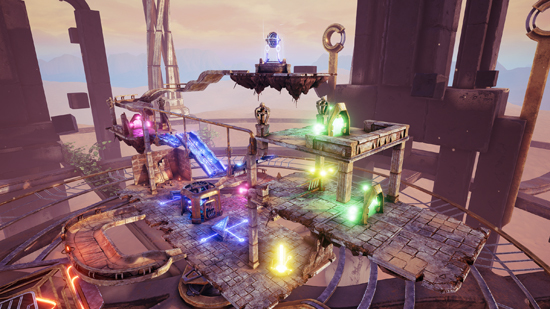 Physics-based puzzle title Marble Land is available now on Steam for Oculus Rift and HTC Vive, with a Gear VR version coming to digital stores later this month. In Marble Land, players immerse themselves in an alien world where they take control of grandiose gadgets, reminiscent of Rube Goldberg devices, in order to guide the blue marble to safety. In Marble Land, players come up against 45 increasingly complex puzzles set on intricately designed platforms. The goal is to clear the way for the blue marble to reach its green target. Players interact with the environment rather than the marble, manipulating various structures with different mechanics (changing the direction of the marble, teleporting it, etc.) that affect the marble’s path with each change on the platform. Players are allowed to spawn an unlimited number of marbles while figuring out the correct configuration of the puzzle elements that would lead the marble into the target. Marble Land is also planned to launch on PSVR and Google Daydream early next year.